Klim engineers a complete array layering solutions for every possible outdoor condition, specifically designed for the rigors of powered and unpowered outdoor activities. 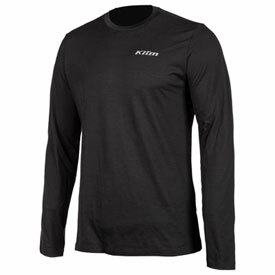 The Klim Teton Merico Wool Base Layer is the ultimate layering option for your outdoor adventure on motorcycles, snowmobiles or any other outdoor activity. Built with a Klim-specific 80/20 formula of Merino wool/nylon, Teton Merino Wool offers an industry-first complement of everyday functionality including multi-day odor resistance, warm and cool reactive temperature regulation, comfort and breathability. Temperature regulating warm to cool. Custom 80/20 blend of Merico wool/nylon specifically designed for the rigors of motorcycling/snowmobiling while remaining 100% functional for casual use and retaining all the benefits of Merino wool. Knit from sub 17 micron Merino fibers for unequaled comfort. Extremely versatile/regulates your microclimate in both hot and cold climates (able to keep you warm and cool built into one garment). Maintains insulating value even while wet. Open body fit not too loose, not too tight.